Frieda Loves Bread: Pizza Night! Our family loves pizza...but we are split between the thick Chicago style and the thin New York style. It's a good thing when we make our own, because we can have the best of both worlds! Tonight we decided to bring back a favorite copy-cat recipe of Boboli Pizza dough, topped with meats, cheeses, and mushrooms on Brad's half. When cooking a pizza crust, I like to poke holes in the crust with a chopstick (about 2" apart), parbake (cook almost done) and then put the toppings on. 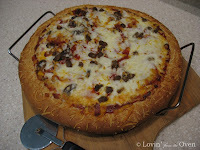 Cooking on a pizza stone also helps the crust cook all the way through...no doughy pizza! You will find a pizza crust and tomato sauce recipe here. I used most of the sauce on this pizza and reserved some for the "dippers" in the family. Put wheat flour into a mixing bowl with yeast, gluten, and salt. Combine water, honey and oil. Dissolve well. Pour onto wheat flour, mix well, and sponge for 10 minutes. Add flour one cup at a time until dough clings to hook and cleans sides of the bowl. Knead for 5 minutes. Dough should be smooth, elastic, and feel wet, but not sticky. Oil top of dough, cover with plastic wrap and rise in a warm, draft free place for 30 minutes. Take dough out, punch it down, and let it rest on the counter, covered, for 10 minutes. Sprinkle cornmeal on a pizza stone. Place dough on it and roll into a 14" circle. Take a chopstick or similar instrument and poke holes in the dough, about 2" apart. This keeps the pizza uniform in shape without huge bubbles in it. Spritz lightly with water and sprinkle with Parmesan cheese. Bake in a 400 degree oven for 15-20 minutes, covering it lightly with foil during last 5 minutes to prevent over browning. Put desired pizza toppings on and bake for an additional 10 minutes or until cheese is brown and bubbly.